When there is very little before the New Yeartime, each of us starts taking care of buying and preparing a gift for our close people. I want to make something memorable, a variant of an unusual and original gift in this case is extremely difficult. A wide variety of gifts for Christmas and New Year brings us to a situation where finding a truly worthwhile gift is extremely difficult. But, passing one after another, dozens of shops, in your head, the belief that the best gift is best is best done by oneself. Sometimes, it seems to us that we are not able to do something special and individual, relying only on our own skill. We'll tell you no! This master class offers you three wonderful ideas, thanks to which it will not be difficult to realize your potential and make absolutely new and interesting gifts. 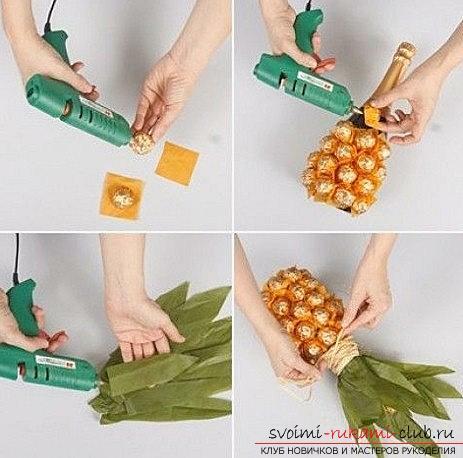 First, it is an opportunity to make an exclusivea gift that will stand out among others. Secondly, it is a unique chance to develop own opportunities in craftsmanship of needlework and learn something new. And of course, there will be no limit to your creativity. The article will present 3 variants of the most interesting and unique gifts that you can realize to your loved one, according to his tastes. Sweet present for New Year's holiday Universal gift choice for any person is candy crafts. Of course, sweet gifts are an obligatory attribute of the New Year holiday and are actively brought to children in the kindergarten with Grandfather Frost, and also appear on various store shelves. Adults are also very happy to try something sweet. But, they need a special approach. For example, a regular set of chocolates, which was decorated with a completely new principle - can be an excellent option for a presentation to your close friends or friends. With the help of paperboard we mustform a cone. The paper should have sufficient density in order to sustain a number of sweets and their weight. We use for binding materials of adhesive tape, glue, and also a stapler. 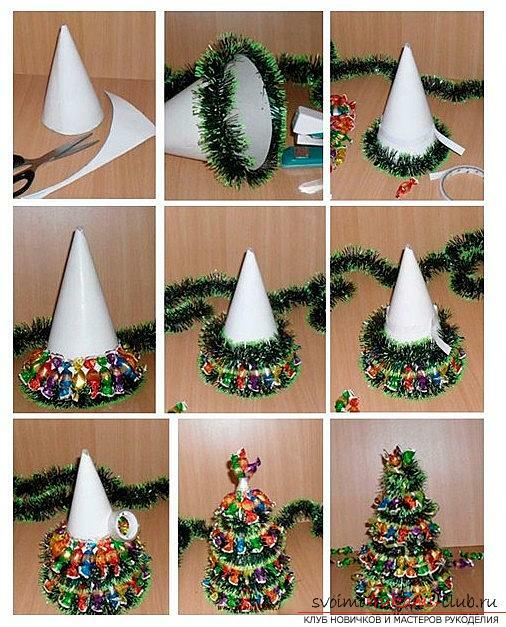 Take our cone of paper, as well as scotch tape for twohand and glue the tails of sweets and this piece. You can use gluing with even rows, you can also choose a chaotic scheme. 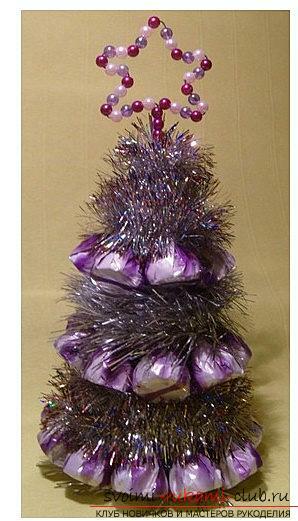 We use tinsel in order to fill the free space that remains after the fastening of all the sweets. Such a simple, but at the same time, made with love crafts! 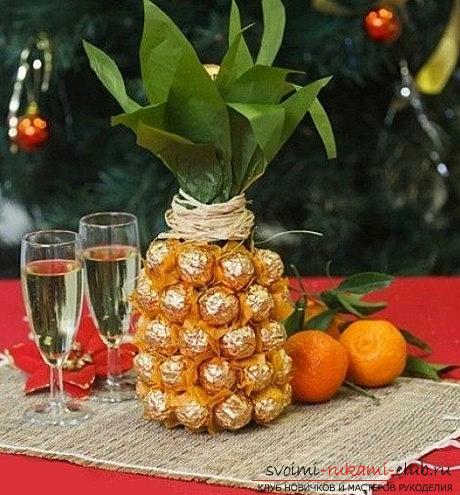 Chocolate pineapple on New Year's Eve Another variation of the sweet gift for the newyear, which can be done by any master of needlework without much difficulty. We take an ordinary bottle of champagne, which we try to stick with sweet and delicious sweets. Also, you will need elements of a graphic composition to work to supplement the overall picture. We assure you, the result will meet your expectations! For those who know little about the unique techniquedecoupage, which allows you to transform any subject - a simple instruction is offered for work with your own hands. Initially, we have to separate the upper part of the layer from the napkin element, where the drawing is located. Then, using the scissors, cut out the image we need. Use a special glue to place the picture on the bottle. As a replacement for special glue, you can use the services of a sticky substance PVA. It is bred in water with a ratio of 2 to 1. 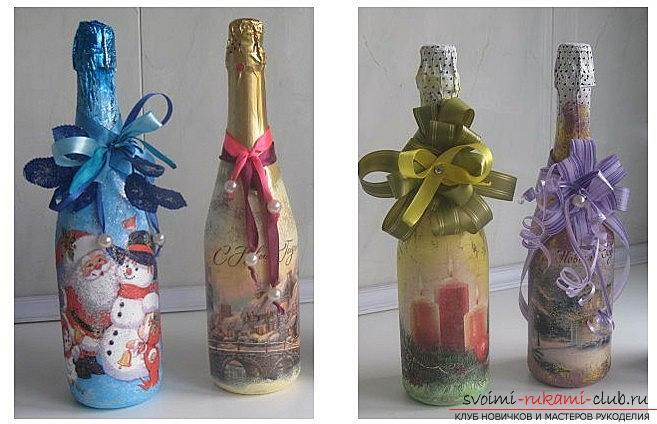 At the final stage, we leave the decoration of the bottle, using the services of various ribbons and beads. Optionally, you can add variations of your own decor for the bottle. Sledge and Santa Claus An excellent gift is candy. They are easy to find, have the opportunity to pack and enjoy! But, no one cancels the beautiful design for this presentation. Therefore, we will try to design a beautiful solution for the presentation in the form of a successful set of sleds with Santa Claus. 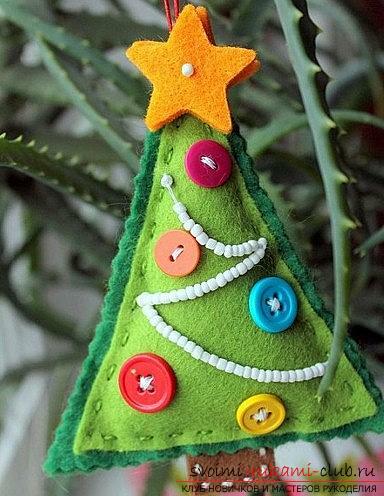 You can prepare spectacular gifts using felt material. Close people will rejoice at such interesting ideas, and realize them will not be difficult, especially as materials can use the usual fabric of felt, take paper, prepare buttons, materials of natural origin. Even old light bulbs can turn into a unique craft item that can be realized with your own hands. 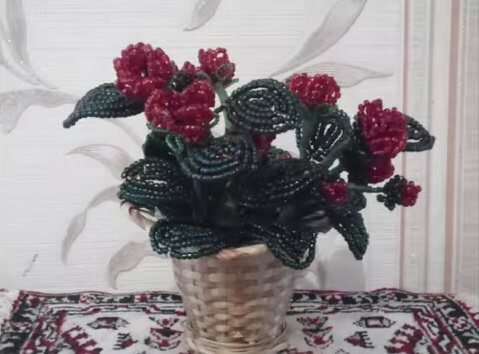 They can be painted with bright colors and you will get a really interesting, unique decoration. Snowman from Sock For the Christmas tree is also inherent in preparing various toy characters. Most often use a company from Santa Claus, as well as Snow Maiden. But, it can also be supplemented with a beautiful snowman made by own hands. Ordinary socks can become a ready-made material for work. Origami box, made by hand according to the scheme, will be an excellent packaging for the gift.